Regular readers will know we do have a particular affection for the odd barbecue gadget, the next gadget to make our outdoor cooking that little bit easier is the Qbag, an aluminium foil bag for cooking food that doesn’t normally work so well on the grill. 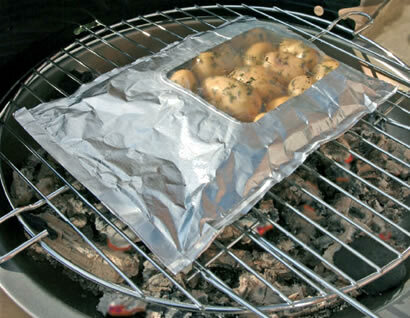 I’ve often wrapped mushrooms and garlic up in tin foil to cook on the BBQ but the Qbag does offer one other advantage, it has a window so you can watch the food burning cooking and it also peels away so you can turn items if needed. It’s not vastly superior to the old wrap it in tin foil trick, but hey it’s a gadget. The Qbag costs $5.95 (~$12) for 8 from Prezzybox.